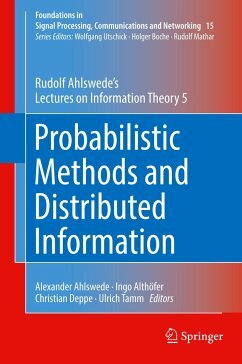 The fifth volume of Rudolf Ahlswede's lectures on Information Theory focuses on several problems that were at the heart of a lot of his research. One of the highlights of the entire lecture note series is surely Part I of this volume on arbitrarily varying channels (AVC), a subject in which Ahlswede was probably the world's leading expert. Appended to Part I is a survey by Holger Boche and Ahmed Mansour on recent results concerning AVC and arbitrarily varying wiretap channels (AVWC). After a short Part II on continuous data compression, Part III, the longest part of the book, is devoted to distributed information. This Part includes discussions on a variety of related topics; among them let us emphasize two which are famously associated with Ahlswede: "multiple descriptions", on which he produced some of the best research worldwide, and "network coding", which had Ahlswede among the authors of its pioneering paper. The final Part IV on "Statistical Inference under Communication constraints" is mainly based on Ahlswede's joint paper with Imre Csiszar, which received the Best Paper Award of the IEEE Information Theory Society. The lectures presented in this work, which consists of 10 volumes, are suitable for graduate students in Mathematics, and also for those working in Theoretical Computer Science, Physics, and Electrical Engineering with a background in basic Mathematics. The lectures can be used either as the basis for courses or to supplement them in many ways. Ph.D. students will also find research problems, often with conjectures, that offer potential subjects for a thesis. More advanced researchers may find questions which form the basis of entire research programs. Rudolf Ahlswede (1938-2010) studied Mathematics in Göttingen, and held postdoc positions in Erlangen, Germany and Ohio, USA. From 1977 on he was full Professor of Applied Mathematics at the University of Bielefeld. His work represents an essential contribution to information theory and networking. He developed and contributed to a number of central areas, including network coding and the theory of identification, while also advancing the fields of combinatorics and number theory. These efforts culminated in his research program on the "Development of a General Theory of Information Transfer". In recognition of his work, he received several awards for "Best Paper", as well as the distinguished "Shannon Award". 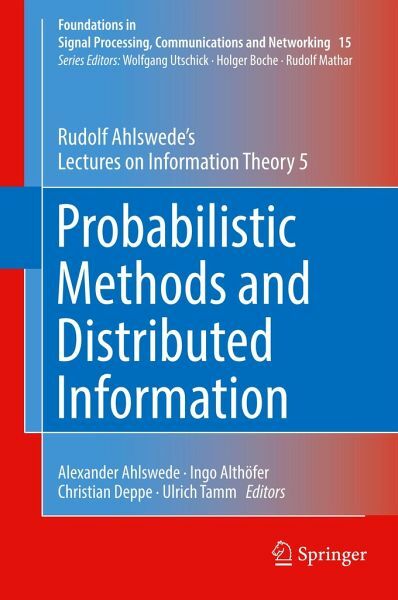 Words and Introduction of the Editors.- Preface.- Arbitrarily Varying Channels.- Continuous Data Compression.- Distributed Information.- Statistical Inference under Communication Constraints.- Appendix.- Remembering Rudolf Ahlswede.- Comments by Ulrich Krengel.- Subject Index.- Name Index.